Photo received from Tom Benjey (USA) of five Carlisle Indian School football team visiting St. Louis, Missouri in late 1908. 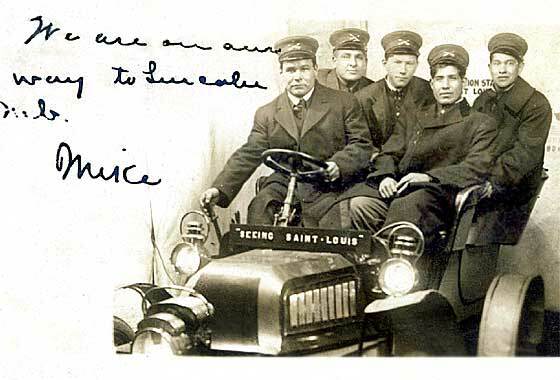 The car could have been used at the 1904 St. Louis World's Fair (or the Louisiana Purchase Centennial held a year late). The picture is unhelpful in not showing any of the lower parts. In view of the bonnet having no flap on the nose and having a single central headlamp we consulted with our AACA colleagues and have determined that this is cca 1902 Thomas Model 18. Lovely 1903 postcard received from Jan Sekta, (Poland) which probably shows officers from the Fortress Boyen in Gizycko. 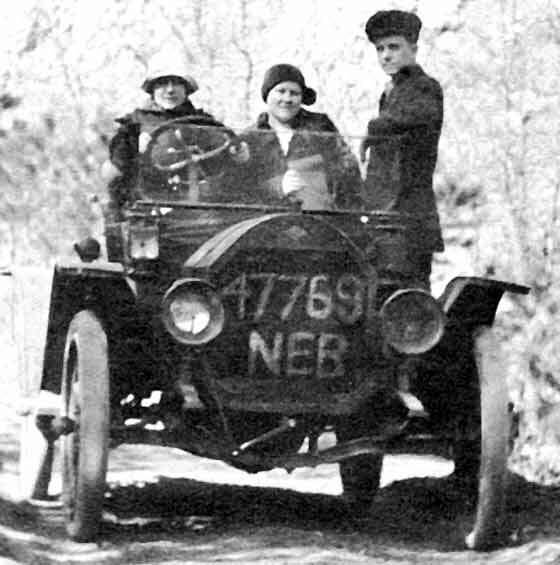 The car seems to have a circular radiator which our Swedish correspondent Leif Holberg suggested could be a German NAG, confirmed as a cca 1903 NAG, possibly the 4 cylinder 20PS car. NAG was a division of AEG the famous German Electrical Company which started car manufacture in 1900, lasting to 1934, when commercials only continued as Bussing-NAG. Period photo received from Alan Bourne, Abingdon (UK) from an elderly lady who claims it to be one of the first cars in Scotland, at a large country house near Glasgow which still exists as a hotel. 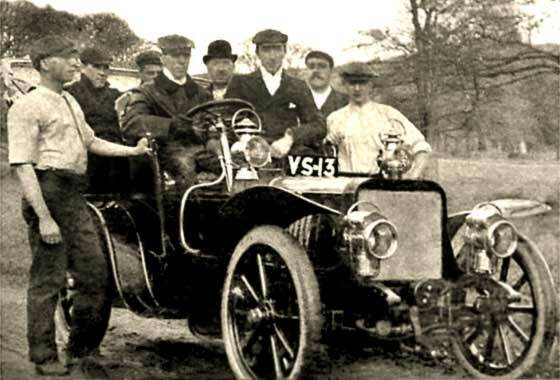 -- Certainly one of the early cars in Scotland, 13th car registered by Greenock Borough Council in early 1904. 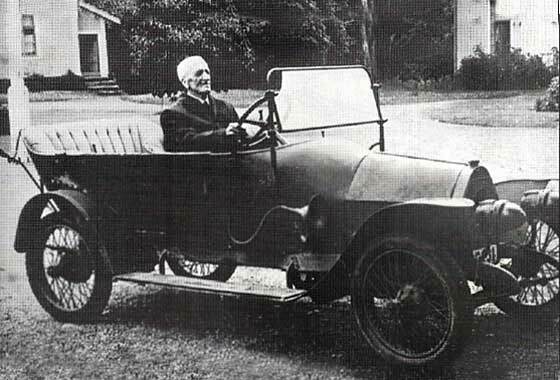 Cars had been in use since late 1890s, so cars would not therefore have been unusual in Scotland. Subsequently identified NOT as an Argyll but a cca 1904 Darracq 15HP . 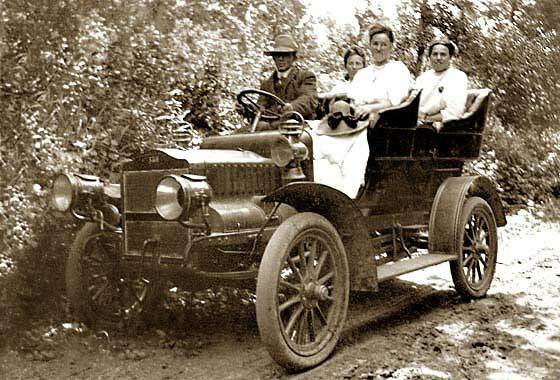 Lovely period photo received from Steve McBrady (USA) of a car he believes his Grandfather photographed in 1915. Was it a Ford? -- No not a Ford nor what we initially thought was a White. With the assistance of our friends at the AACA we have determined that the car is fact a cca 1905 Maxwell Model H. The negative may have been flipped so we have reversed it to show RHD steering. The 'protuberances' on the lower bonnet hide a two cylinder engine and separate flap for the spark plug. Newspaper cutting photo received from Ruben Arauz (Panama) who would like to know the manufacturer of what he understands was the first car in the Republic of Panama, brought from Paris in 1906. Is it a Renault taxi or bus? -- We are relatively sure it is not a Renault. 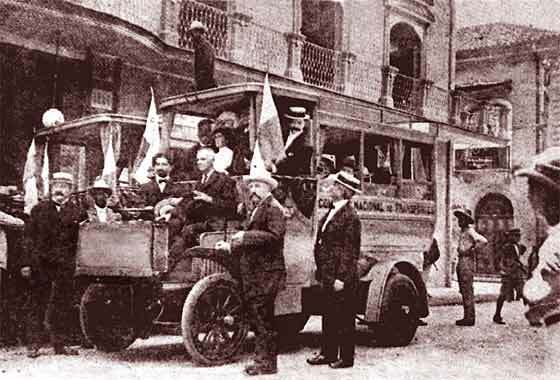 Renault cars and busses had the radiator behind the bonnet, and the first Renault bus was not made until 1907. We are also relatively sure this is a near Paris made cca 1906 Ariès Omnibus 12/14HP, 12 - 16 passenger. Enquiry posted by Idigghx (USA) based on one of his ambrotypes. Due to mold, the slide became destroyed but he had carefully previously captured the image. The photo was a digitally enhanced version of the slide. He wanted to find out the year, make and model of the car. -- The photo was quite distorted so we corrected it. We are almost certain that this a USA made car being a cca 1906 Mitchell B4 Two Seater but it has been suggested that it could be a C4. Other makes had similar rads. Photo received from Mark Walther (Philippines) who asked permission to reproduce our article about Steam powered automobiles in the city of Baguio, Philippines. This relates to our main article "Stanley Steamers in 1908 Philippines". 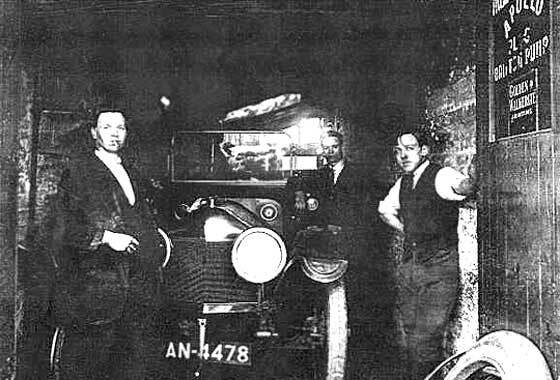 The vehicles shown in the photo are however the subsequently purchased cca 1910 De Dion Bouton Charabancs which were introduced into service mainly because the Stanleys consumed vast quantities of water, not having condensers. Cropped photo received from Mary Pellatt (UK) found among a selection of items from her mother's effects while compiling a family tree. Is it is possible to find the original owner's name; if the name was Allkins that would be a real bonus! -- Registration is Birmingham CBC but records no longer exist. There is no trace of this number in current DVLA records. So car was probably scrapped and unlikely to find out. 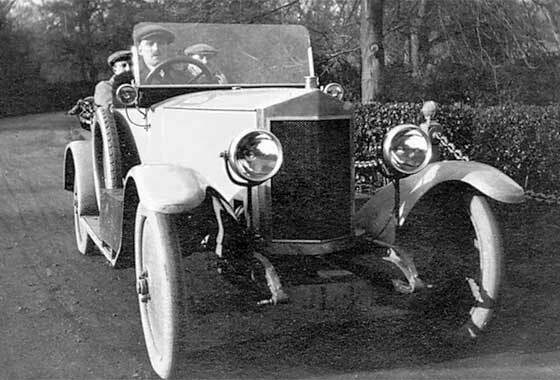 The car is very unusual, being a cca 1909 BSA Tourer, possibly 25/33HP. 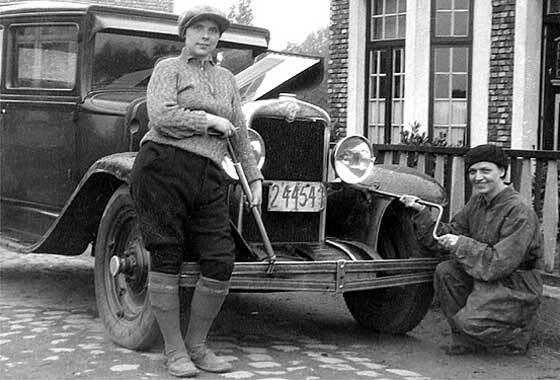 One of a number of very interesting photos submitted by Cartom Weaving showing vehicles in the 20s and 30s Scandinavia, for which he is seeking identification and dating. He was after information on the centre vehicle. -- Regretfully the photo appears scanned from print so moire dots make identification difficult when magnified. None the less, we are relatively sure this is a cca 1909 Adler Truck from Germany. Adler imported American bicycles in 1880, and still makes typewriters. Photo submitted by Jasong (USA) who thought that the diamond logo may help. -- The car is obviously north American but unfortunately a number of makes had a diamond shaped logo; Everitt, Dorris, Page, McLaughlin etc. 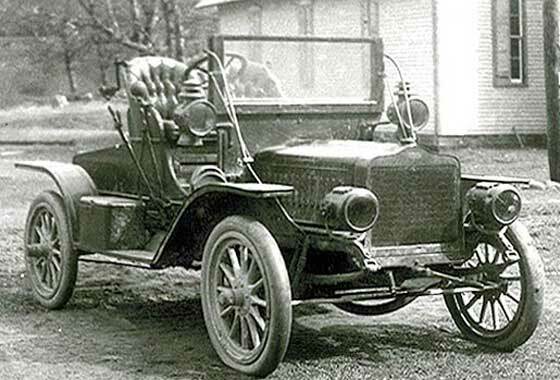 Our colleagues at the AACA had a leaning towards the Everitt but we were relatively sure because of the full elliptics and very stubby dumbirons, cut-offs on side of the radiator at bottom and pronounced dip in the front axle, all suggest a cca 1911 Jackson Tourer. One of a number of very interesting photos submitted by Cartom Weaving showing vehicles in the 20s and 30s Scandinavia, for which he is seeking identification and dating. -- This one has remained unidentified for a while but on return viewing it seems to be cca 1911 Mathis Baby Torpedo. Torpédo is a European name for an open touring car. In France it would also refer to a car with a pointed back. The word torpedo (in submarine) originates from an electric ray torpediniformes. Photo received from Ian Bullock (UK) showing his Great Grandfather 'and his son', taken in Cheadle Cheshire. -- As it is quite an unusual car we asked for more information but did not receive courtesy of a reply. Registration CH 871 was issued by Derby County Borough Council in late 1913. We are relatively sure the car is of Italian origin with a British body. The badge on the radiator suggests a cca 1913 Bianchi Tourer, possibly a 12/18. Bianchi were then third largest manufacturer in Italy. Two photos received from Brenda Batchelor (UK). 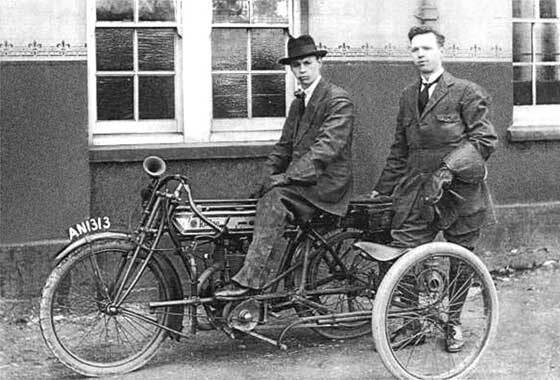 This one with the motorcycle shows her father, Richard (Jack) Herniman standing and his brother Thomas George seated. -- Our motorcycle expert Geoff Morris advises the motorcycle is a cca 1913 Rudge 500 cc combination with exquisite dropped handlebars ! It has a West Ham registration, but individual records do not appear to have survived. It is not a Rudge 'Multi' but a standard 500 cc Rudge, nevertheless a very desirable bike. 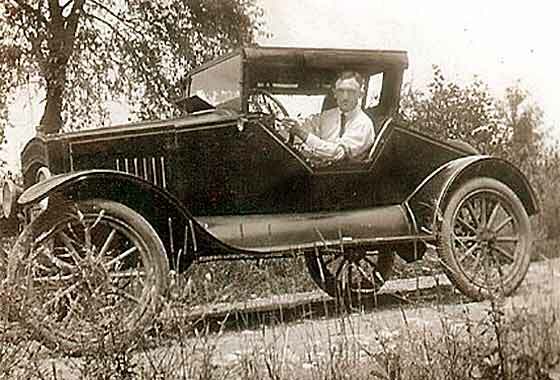 Photo submitted by Jim Mooney (USA) showing his father's first car. He thought it was a Model T with a Morton & Brett aftermarket body. Our colleagues at the AACA Confirmed it was a cca 1914 Model T Ford but were not so sure about the body, suggesting possibly a PACO body. There was a significant industry devoted to manufacturing aftermarket accessories for the Model T and it was common to alter your Model T so that it stands out from the crowd; number of examples on these pages. Two photos received from Brenda Batchelor (UK). This one with Jack Herniman left and George at the back. At this time they were probably living at Stratford, West Ham. T G Herniman ran an engineering business under the name of T G Sorrell (his mother's maiden name) during the 1920s, not very far from Chapel Street. -- The car has taken a bit of identifying but with help from our Tim Harding, it an unusual cca 1914 Oakland Tourer from USA (- later Pontiac). 12,000 made in 1915 ! Another small photos received from Mahmoud Ezzeldin (Egypt) asking for identification. Photos shows Prince Abass Halim of the Egyptian royal family, grandson of Prince Mohamed Abdel-Halim and son of Mohamed Ali, the founder of the dynasty. Standing is the chauffeur. -- This is not a positive identification as our experts have not come up with an answer. The little sub lights typical of German and Italian cars. Rad does not seem 'Germanic' and does look much like a cca 1918 Bianchi. Photo received from Philip Rowett (UK) from albums that belonged to his great-uncle Harold Giblett, who was employed by Vauxhall Motors between 1910 and 1914, as Chief Draughtsman to Laurence Pomeroy. Our experts have not come up with any suggestions. 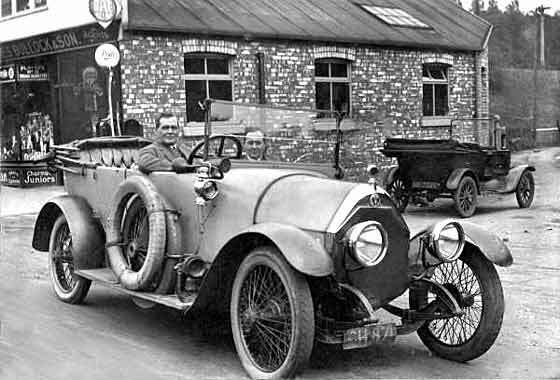 The radiator has the popular overseas V shape, but I think it could be the UK made cca 1920 JL Tourer. Not much is known except that the cars were built in Dulwich, London, used 1.5L Decolange engine and bodywork in plywood. Cinema screen grab received from Mark Dawber (New Zealand) of a car which appeared in a 1938 film called 'Orage' and is being investigated on IMCDB. -- We are relatively sure this an 'exotic' French car because it carries the famous Lalique 'victoire' flying head mascot. Initial thoughts of Georges Irat were superseded by being relatively certain this is a cca 1926 Donnet-Zedel. 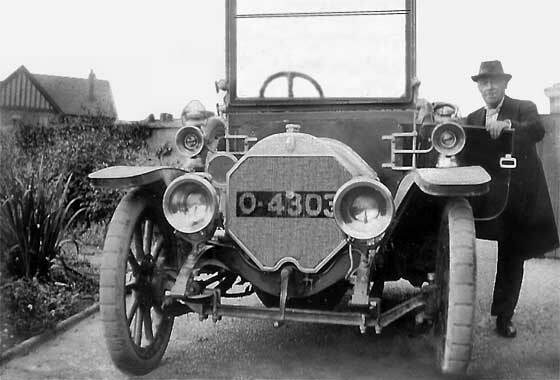 The most significant pointers were two filler caps on bonnet, and the miniscule mudguard mounted sidelamps. Photo received from David Williams, Bristol, (UK) trying to identify the location of the picture from the cars with 'pointed radiators'. 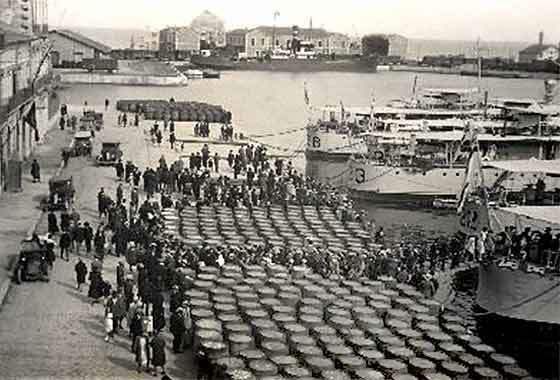 The ships in the picture were from 1927 until 1932 part of the Mediterranean Fleet. Ships with visible pennant numbers are V & W Class destroyers of about 1917, Vimiera 23; Vampire 68 and Waterhen 22, all served until the end of WW2. -- We think that the 'pointed radiators' are in fact the scuttle bonnets of French Renaults, between 1924 - 30, so France. 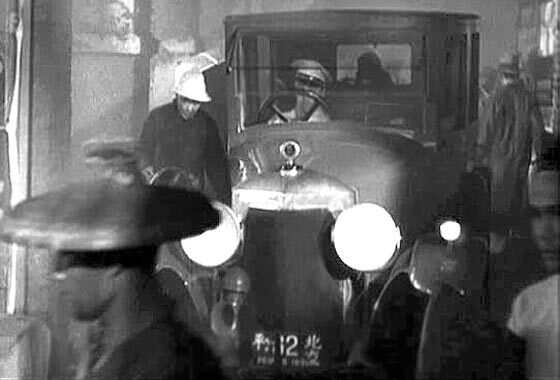 Cinema screen grab received from Mark Dawber (New Zealand) of a car which appeared in a 1932 film called 'Shanghai Express' and is being investigated on IMCDB. -- We are relatively sure this a cca 1926/8 Austro Daimler AD 617. It has the sharp edge on the radiator profile unlike some of the other A-D models which were more rounded. 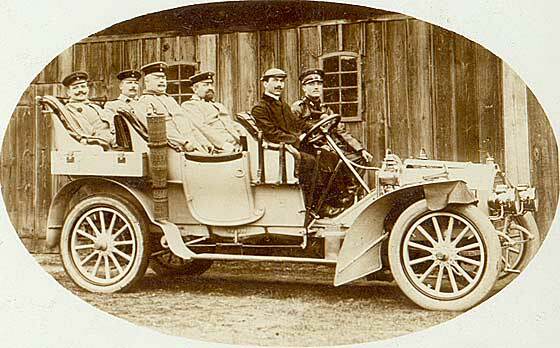 A-D made German Daimlers under Licence. Emile Jellinek, of daughter Mercedes, had Austrian firm selling A-D cars as Maja, - other daughter. Really quite fascinating set of photos received from Alan Weeks (UK) of history society on the Cheshire/Staffordshire border. They are giving a talk about a trip the local lord of the manor (Sir Philip Brocklehurst) undertook with his wife and a mechanic across the Sahara in 1930 (the first convoy of fewer than 3 cars). 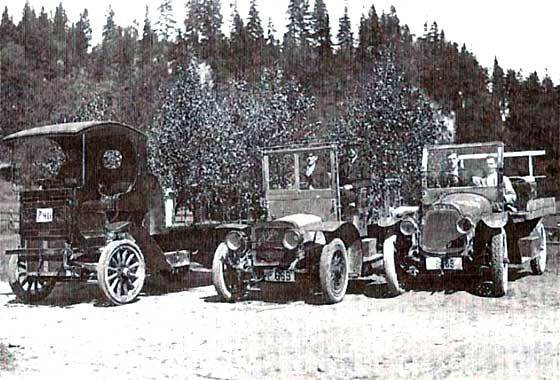 -- The vehicles were American 1929 Chevrolet Series LQ 1.5 Ton Trucks with custom made UK bodies. The UK registration dates them to Autumn 1929, registered at the London C.C. Quirky photo received from Ruddy Sommereyns of Temse (Belgium) who found a lot of negatives at a local fleamarket and converted to a positive images with the computer. Can we identify the car? He thought it must be around between 1930 and 1940. -- Yes indeed you are nearly correct. We believe the car is a cca 1929 Chevrolet Four Door Sedan. Photo suggests perhaps why there are not so many lady mechanics; pumping up a bumper and putting a starting handle into the headlight. 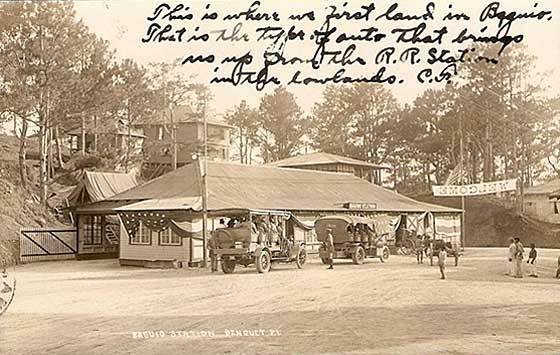 Photo received from Mark Walther (Philippines) who asked permission to reproduce our article about Steam powered automobiles in the city of Baguio, Philippines. 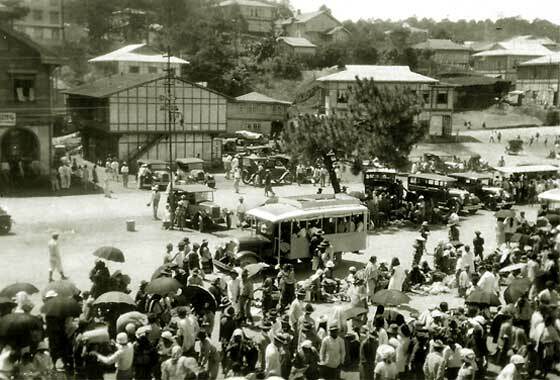 He also sent us a much later photo of a much more modern bus at Session Road Baguio Market and wondered if we could advise what it was. The shape of the radiator cowl suggest it could be an American cca 1934 Diamond T Bus. Diamond T were well known for their heavy prime movers, military and WW2 tank transporters. 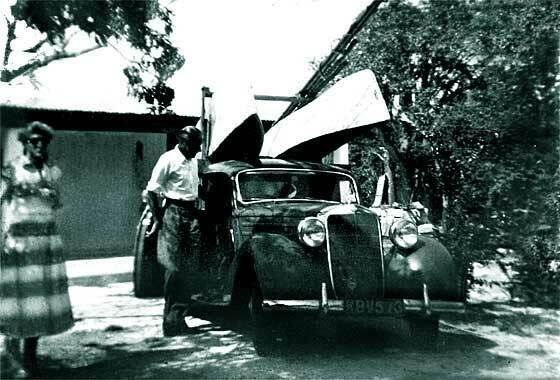 Another photo received from Philippa Elmhirst (UK) of her parents in Kenya with their car and with a sailing boat built by her father. She wanted to pinpoint the date. -- We have an interesting problem here. The car is a cca 1951 Mercedes 170. The registration 'looks British'. If so, Blackburn CBC in 1958. However Philippa is sure the photo was taken in Kenya. It does seem that all Kenyan plates started with K and looked UK. Seems silly to have two identical plates in the same Empire! Information received from our Member Tony Spencer (UK) saying he owned a quirky microvan in the 1950s. He purchased new a 1958 Anzani Astra Light Commercial Utility. 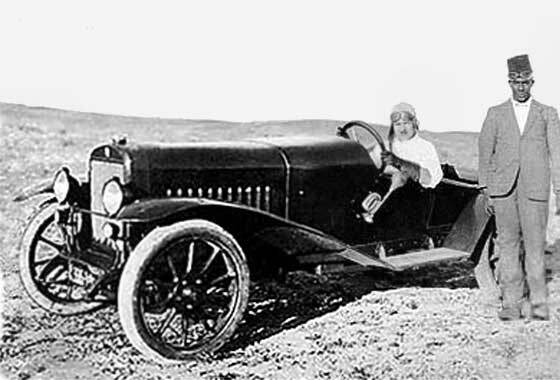 The car was built by a subsidiary of the British Anzani Engineering Co Ltd in Middlesex and had an underfloor 322cc Anzani engine. It was a two seater station wagon which was advertised as being fully owner maintainable and able to give fully loaded 60mpg. Cost £347.16.00. Unfortunately it caught fire and burnt!